Loved this post from Quinn Creative on finding yourself instead of trying to be someone new, in regards to New Year’s Resolutions. Great advice! I think that will be copied into my journal. 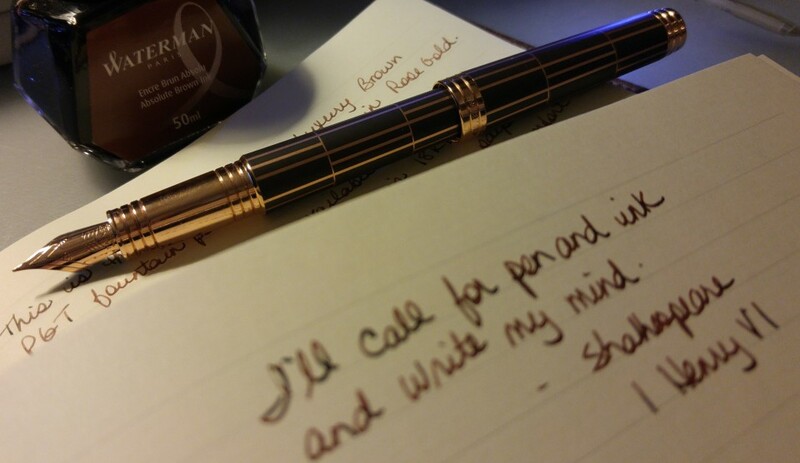 Beautiful review of PaperMate Flair Pens from The Pen Addict. Love the colours. SBRE Brown introduced a new sponsor of his endeavours: http://www.fontoplumo.nl/. Beautiful site and they ship internationally! I really enjoyed watching Rhomany’s video on the Really Big Notebook from productiveluddite.com. I visited their website and they have some really great notebooks which they ship anywhere for free. And – if you buy a notebook they plant ten trees. How cool is that? I watched SBRE Brown’s video called Time for Some Kind Words for the Pen Habit and it made me sad. Matt puts so much production value into his videos and it’s disheartening that negative voices on YouTube made him feel so bad about what he was doing. Be sure to read his touching blog post to get the full picture about why he is taking a hiatus from posting videos. I applaud him for taking control of his life. And I know I tend to flog this idea to death, but here is yet another article from Ryman Blog on why writing by hand helps you to remember things and to study better and just to be a better person all round. The Empathic Teacher talks about how she loves paper and notebooks, even in this digital age, and even when she has to lug around 30 composition books. Millie at Planet Millie introduces us to Monologue notebooks, which I think are fantastic. Look at the pen loop that is incorporated into the back cover! And the mini notebook with its ingenious elastic closure. And stay tuned because she’s going to be hosting a giveaway of these notebooks soon. Mr. Brown has his own website! Yes you can now visit SBRE Brown at his website and look for that obscure pen video you think you saw him do two years ago. It’s an invaluable resource and database of all the knowledge he has shared with us over the years. Well done Mr. Brown! I am absolutely in love with Melinda’s planner pages which she shares in her 2014 Updates post on School Supply Dance. Each page is different; some hand drawn, some computer designed and printed. Lovely. And finally I think I have decided the Cleveland Browns are my favourite football team; I do not watch nor do I understand football but this article about them and their un-hackable notebooks in the Wall Street Journal melted my heart. Enjoy. Last week I forgot to mention I got a bottle of J. Herbin Bleu Pervenche and a bottle of De Atramentis Heather Violet in the same Goldspot order as the Visconti Rembrandt. I’ve never put anything but Bleu Pervenche in my Monteverde Prima and when the cartridges ran out I had to buy a bottle. And the Heather Violet I bought (I will admit it) because of the name. I’m really glad I did because it is a beautiful shade of pink. More future blog posts! I am a big fan of SBRE Brown on Youtube and I watched his video Personal Questions with SBRE Brown, Part 2. He quoted an incredibly beautiful prayer by Saint Ephraim which I promptly copied into my journal. The video is long but worth it. Went a bit crazy on ebay – more future blog posts ha ha! 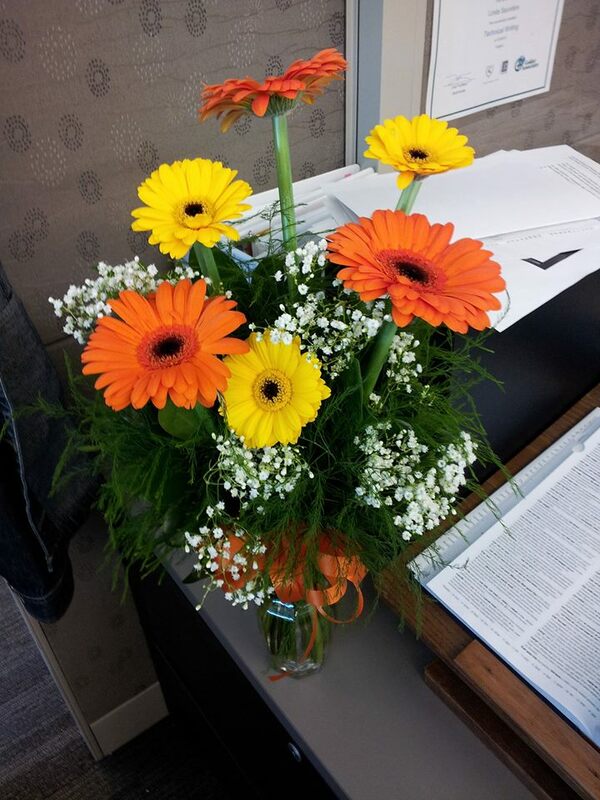 Had a lovely surprise at work this week; David sent me flowers for our anniversary. They are beautiful and I feel very special. He pointed out this is technically my second gift because he bought me the Visconti set. Yes I’m spoiled. I bought him an Amazon gift card which he loved. Eight years married – where has the time gone?